If you missed it last night, catch it on archive! The Artcasters #126, A live show featuring art talk from artists Scott Serkland, Joshua Kemble and a rotating third guest chair. 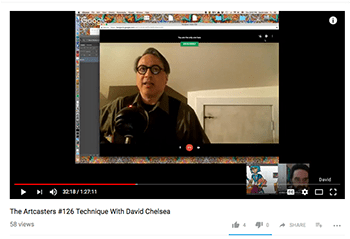 This week’s special guest is me, Eisner nominated David Chelsea, showing image files of current comics work for a scintillating hour and a half while chatting with Joshua and Scott about comics, perspective, and why the scalloped edges of a sharpened pencil are hyperbolas. Highlight: me begging for storyboard work! Next Next post: American Bystander #7 Has Arrived!